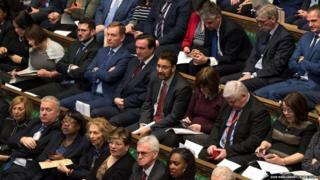 This was laid down in the motion from Conservative MP Sir Oliver Letwin and others to ensure that time was not taken away from it by, for example, a sudden rash of ministerial statements or urgent questions. Up to the first hour can be taken up by debate on a Business of the House motion, setting out the ground rules for the debate itself - which could see, for example, attempts to amend the voting system between the various options, or maybe separate out means from ends, so that different variants of Brexit were considered, but options like a second referendum were not mixed in. Again, there is a hard time limit, to stop MPs filibustering about procedure rather than getting onto the meat of the debate. Once the Business of the House motion and any amendments to it are dealt with, Mr Speaker will announce which amendments he has selected for debate. This will be an important moment, because the credibility of the entire exercise rests on MPs having a broad choice of options, and any selection seen to exclude part of the spectrum of possible choices would defeat the point of having indicative votes. The selection of amendments would be based on (highly flexible) criteria, like the breadth of support, and the distinctiveness of each possible alternative; it is unlikely that the Speaker would choose two almost identical propositions for example. But he would be keen to avoid swamping MPs with too many alternatives. Much will depend on the precise terms of the final, possibly amended, Business of the House motion - the motion itself would probably emanate from the group behind Monday's Letwin amendment, but there is nothing to stop someone else, including the government, tabling their own rival version. It would then be for the Speaker to select. In the main debate the expectation is that there would be movers speaking for each proposition, and MPs could then debate them all together - and there would probably be speakers from the Opposition and the government winding up. The voting is expected to take place over half an hour, from the end of the debate at 7pm. It will probably take place in the "No" lobby, immediately next to the Commons Chamber. MPs will vote, not by filing through the lobbies, as usual, but by filling out a ballot paper. They would be invited to vote Yes or No to each alternative on offer, and the totals for and against each of them would then be counted by the clerks. And because the ballot papers would be signed by the MP completing them, the result will eventually be a full list of who is for and against each option. The sitting of the Commons will be suspended for that half hour - but it will doubtless take rather longer for the results of the vote to emerge. When MPs get back into the Chamber they will have 90 minutes to debate the statutory instrument which postpones Brexit Day - a debate which is pretty sure to result in a traditional Commons vote. It is possible that the Speaker may be able to announce the results of the indicative votes in the middle of this debate. The other little detail tucked away at the end of the Business of the House motion proposed for Wednesday is a proposal to provide another opportunity for MPs to take control of the Commons agenda on the following Monday 1 April - so be prepared for a repeat performance.